(a) This manual is written in accordance with SAE J2008. (c) The following procedure is omitted from this manual. However, this procedure must be performed. (1) Use a jack or lift to perform operations. (2) Clean all removed parts. (3) Perform a visual check before and after performing any work. (a) An alphabetical INDEX section is provided at the end of the manual as a reference to help find the item to be repaired. (a) Use of Special Service Tools (SST) and Special Service Materials (SSM) may be required, depending on the repair procedure. Be sure to use SST and SSM when they are required and follow the work procedure properly. A list of SST and SSM is in the "Preparation" section of this manual. (a) A component illustration is placed under the title where necessary. (b) Non-reusable parts, grease application areas, precoated parts and torque specifications are noted in the component illustrations. 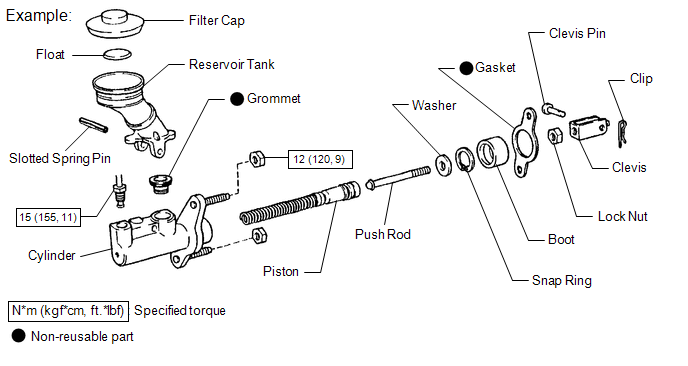 (c) Torque specifications, grease application areas and non-reusable parts are emphasized in the procedures. (d) Only items with key points are described in the text. What to do and other details are explained using illustrations next to the text. Both the text and illustrations are accompanied by standard values and notices. (e) Illustrations of similar vehicle models are sometimes used. In these cases, minor details may be different from the actual vehicle. (f) Procedures are presented in a step-by-step format. (a) Specifications are presented in boldface text throughout the manual. The specifications are also found in the "Service Specifications" section for reference. Possibility of injury to you or other people. Possibility of damage to components being repaired. Provides additional information to help you perform repairs. (a) The units used in this manual comply with the International System of Units (SI UNIT) standard. Other units from the metric system and the English systems are also provided.